Metro Fire crews were dispatched to the 9000 block of Folsom Boulevard for multiple callers reporting a house fire. 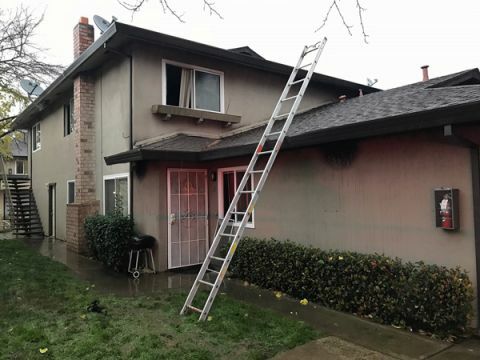 Just after 7:00 am on January 7th, Metro Fire crews were dispatched to the 9000 block of Folsom Boulevard for multiple callers reporting a house fire. First arriving crews found heavy fire coming from a four-plex and immediately initiated fire attack. While firefighting operations were occurring in the unit of origin, additional firefighters initiated fire attack in a second involved unit and began searching for trapped residents. A common attic throughout the four-plex allowed the fire to spread quickly. With a coordinated fire attack, the thirty-five firefighters on scene extinguished the fire, containing it to the attic and two units. Two units sustained major fire damage. 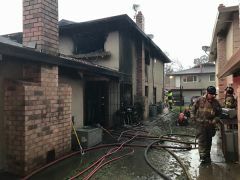 The other two had fire damage in the attic, but only smoke damage inside; firefighters were able to salvage all of the personal belongings from these units. Residents from all four units were displaced; Red Cross was requested to assist the ten adults and four children with temporary housing. The cause of the fire is undetermined. Damage is estimated at $250,000; no injuries to civilians or firefighters were reported.